72065T-SS is rated 2.5 out of 5 by 41. Rated 1 out of 5 by Lisa from Doesn't Work as Anticipated We remodeled our kitchen 6 months ago, but this soap dispenser has been a disappointment and gotten worse since it was installed. It is unpredictable when it will work, and now when it does work it's a few drops of soap. I wouldn't bother replacing with the same one since it appears most have had the same issue as I have. I am looking to replace it with a basic manual model at this point and hoping it's not too hard to switch out. Rated 1 out of 5 by Bodegagirl from Doesn’t work We had this installed in November, 2016. It never worked well. You had to touch it several times to get anything out of it. It workers like that for about 6 months, and then got worse. We replaced batteries, checked the soap, nothing. Then all of the lights stopped working - like the motor was burned out? So now it just sits there looking nice (for more than a year). I keep hoping they come out with a manual one that looks similar in the champagne finish so I could replace it. Rated 1 out of 5 by pbanas from Broken before it started - buy a manual dispenser Delta was very good and replaced this immediately. It arrived a few days later. However, I'd advise getting any faucet like this that does not have a manual override (the touch faucet can be used manually). Our sink is sealed into the granite countertop. Changing this out, even if the replacement was free (and perhaps lifetime) is not an expense everyone will be up for, if it can be done at all. 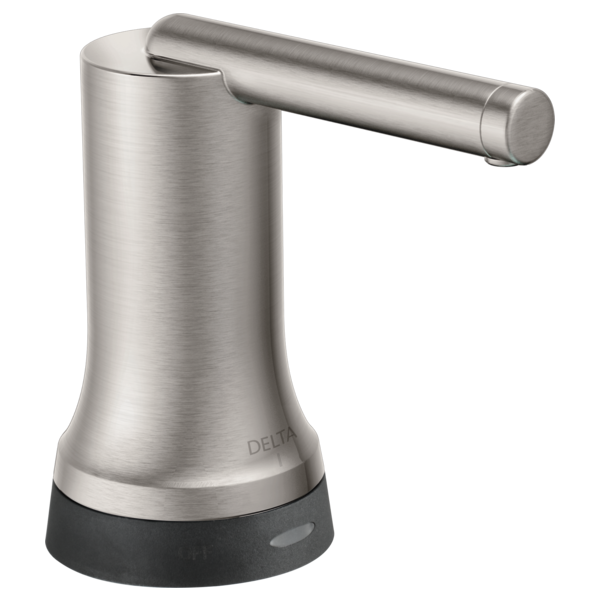 I'm buying ANOTHER Delta manual dispenser to replace it so we aren't dealing with a broken device 5 years down the road. Dumb purchase. Rated 1 out of 5 by Disappointed from Bad design I bought 7 of these for lobby bathrooms. They were a disaster. The touch sensor is poor and frustrates guests who can’t get it to dispense. The twist to off feature make it senseless for commercial use. Will have to replace them all. How do I turn off proximity mode? How do I turn off proximity mode and only use touch? Also how do I program amount dispensed? The quick start link is not working. how much soap does the bottle hold? what size hole do i make in the granite for installation? Stopped working. Purple light flashes once when I tap it. Proximity does not work. No soap dispensed. DeltaFaucet234, I read the manual. I can successfully switch proximity mode on and off. When proximity mode is on, i.e. the blue light came on, the proximity sensor has no effect, but tapping the dispenser results in a single purple light.. When proximity mode is off, i.e. the red light came on, tapping the dispenser results in a single purple light. When it is configuring the amount of soap, i.e. the purple light is solid, tapping it causes the light to flash blue according to the number of taps. So, what you said is not helpful because it's not addressing my problem. can I get a smaller size of soap bottle with my 72065T? The one that came with it. is too big to fit between my sink and cabinetry. Help! would the dispenser work manually?